GM COTAI’s Spectacle has achieved a GUINNESS WORLD RECORD title for the largest free-span gridshell glazed roof, being the first architectural and structural GUINNESS WORLD RECORDS title for Macau, China. [April 17, 2019, Macau, China] MGM COTAI, the integrated resort opened to public in 2018, has achieved a GUINNESS WORLD RECORDS title on January 19, 2019. The Spectacle at MGM COTAI, is the record holder of the largest free-span gridshell glazed roof (self-supporting), making it the first architectural and structural GUINNESS WORLD RECORDS title for Macau, China. The announcement also makes this engineering marvel a new ‘go-to’ attraction that puts the icing on the cake at the 20th anniversary of the establishment of the Macau SAR. The Spectacle is an immersive space of creative and dynamic design, merging nature and cutting-edge technology. Costed over US$37 million to build, the Spectacle Roof is 37m high and is covered by 8,073.1 m² (equivalent to playing area of 30 tennis courts) free-forming triangulated steel grid shell supported only along its perimeter. MGM challenged Kohn Pedersen Fox Associates who collaborated with ARUP to conceive the structural concept and geometry of this expansive glass canopy. Engineered by Siu Yin Wai & Associates Limited (Hong Kong), this meticulously engineered steel diagrid structure spans over the podium space with a clear longitudinal span up to 138.5m, without being supported by any internal columns. Consisted of 4,365 beams and 1,531 beam nodes, the roof structure weighs approximately 2,000 tons (around 1,000 cars). The essence of this impossible engineering marvel is with its unconventional dramatic, flowing, multi-vaulted form results from an efficient structural shell, maximizing the volume of space within the podium area, while minimizing the obstruction of views to the exteriors. In addition to achieving this long span in a single layer structure, the roof design allows maximum flexibility in locating hanging points for exhibition purposes. The Spectacle is an immense 360-degree digital canvas with 25 LED screens in varying sizes, showcasing an exclusive array of digital art collected from around the globe day-and-night. It is also a state-of-the-art indoor vertical garden with more than 100,000 plants, offering a relaxing ambience for dining and leisure. 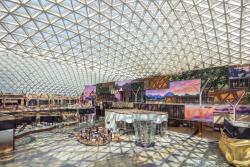 Beneath the expansive glass canopy, the Spectacle seems to be alive, continually evolving and responding to changing conditions such as visitor behaviors, weather, time of day or season, which redefines the way people experience art, entertainment and dining through seamlessly integrated technology. In its first year of operation, MGM COTAI already swept six honors at the Asia Property Awards, including Best Hotel Development (Asia), Best Hotel Architectural Design (Asia), and Best Universal Design Development (Asia). With environmental sustainability at its heart, MGM COTAI is also the largest property and the first mega-size complex project in Macau to achieve the China Green Building Design Label Three-Star Certification. MGM COTAI is the latest addition to the MGM portfolio in China. Designed as the “jewelry box” of Cotai, it offers approximately 1,400 hotel rooms and suites, meeting space, high end spa, retail offerings and food and beverage outlets as well as the first international Mansion at MGM for the ultimate luxury experience. MGM COTAI also offers Asia’s first dynamic theater and a spectacle to wow every guest who steps foot in the resort. MGM COTAI is being developed to drive greater product diversification and bring more advanced and innovative forms of entertainment to Macau as it grows as a global tourist destination. MGM COTAI is the largest property and the first mega-size complex project in Macau to achieve the China Green Building Design Label Three-Star Certification.